The chemistry of the world’s oceans is changing. Ocean acidity is creeping upward, a result of rising atmospheric carbon dioxide. The added carbon dioxide depletes seawater of carbonate, a chemical constituent of minerals that form the shells and structures of animals including corals, molluscs, plankton, and others. The accelerating impacts are expected to reverberate through the marine food web. 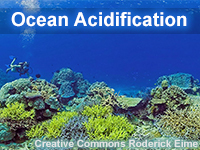 Most people are unaware of ocean acidification and its expected impacts. This lesson will educate policy makers and university students about its causes and consequences. The lesson explains the chemistry and examines ecosystem impacts. A review of the historic and geologic record provides context for today’s observations and future projections of a high-CO2 world. its was an fun and confusing lesson in my opinion but over all interesting and informational. I tried to pick a subject that I was familiar with and found that I needed more than what I considered; enough knowledge. I was glad that I worked through the pre-assessment and then to the actual quiz, because I did make overall improvements. This course training and quiz should be good for any person that needs to brush up on their interests and particular field of interest. I will check back again and find another section that I can train with. I enjoyed this lesson way more than the first lesson. It was easier to understand and straight to the point. This is an amazing course that offers valuable insight into how ocean acidification affects our globe. Describe the observed and projected records of atmospheric CO2, oceanic dissolved CO2, and ocean acidity (pH).